He finds temperature measurements old hat however. He wants to measure heat. That is his academic specialty so no surprises there. What he thinks tells the tale about global warming is the "earth's energy imbalance" (EEI). And to measure that you have to measure the heat in the oceans. The oceans are proposed as the place where the EEI is to be found. He then gives a long and thoroughly persuasive account of just how difficult measuring ocean heat is. But he takes heart from a recent study by Schuckman et al. (2016) which, he says, gives us the answers we need. So has Schuckman in fact given us an accurate measure of ocean heat content? From what Abraham says, you would think so. He uses weasel words but that is the impression. In my usual pesky way, however, I went back to the original academic journal article and had a good look at it. And the result is hilarious. I reproduce below two snippets from towards the end of the article. They are a complete confession of failure to measure EEI -- and the oceans are the alleged chief repository of EEI. So the Schuckman article too says we cannot yet measure ocean heat content. So we now have it from Warmist experts that the claim about heat-gobbling oceans is just theory, not fact. LOL. There is a word for Prof. Abraham in Australian slang. He is a Galah. A Galah is a pretty but very foolish Australian parrot that sometimes kills itself by dive-bombing cars etc. Prof. Abraham is about that silly. WASHINGTON — Alabama’s state climatologist during Congressional testimony on Wednesday warned members of the U.S. House that global warming projections, many of which have been used to justify the Obama administration’s climate agenda, have been wildly inaccurate when compared to real data. "I would not trust model projections on which all policy is based here because they just don’t match facts," said Dr. John Christy, a climate scientist at the University of Alabama in Huntsville (UAH) who has been Alabama’s State Climatologist since 2000. To illustrate his point, Christy displayed a simple chart before the committee that shows how wildly inaccurate global warming projections have been once compared to real data. The red line on the chart below shows the average temperature increase that all of the global warming models projected over the last several decades. The green circles and blue squares at the bottom are the climate variations that actually occurred. 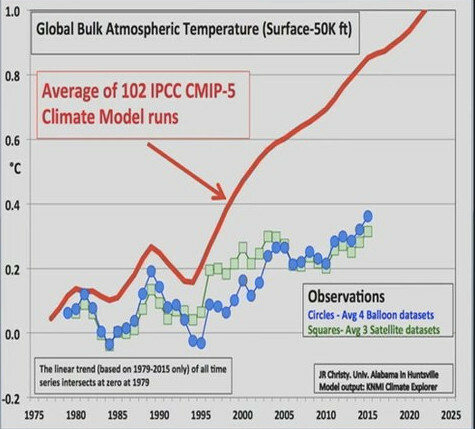 "This particular chart has caused considerable anxiety for the climate establishment who want to believe the climate system is overheating according the theory of how extra greenhouse gases are supposed to affect it," Dr. Christy stated calmly. "The message here is very simple: the theory does not match the observations as measured independently by both satellites and balloons." "It is a bold strategy on the part of many in the climate establishment to put one’s confidence in theoretical models and to attack the observed data," he continued. "To a scientist, this just doesn’t make sense." This is the second time Dr. Christy has made climate-related news in recent weeks. In January he found himself at odds with many scientists and media outlets who were claiming 2015 was the hottest year on record. "2015 Was Hottest Year in Historical Record, Scientists Say," read a headline atop the New York Times. "The whole system is warming up, relentlessly," warned Gerald A. Meehl, a scientist at the National Center for Atmospheric Research. "At some point, you would think most climate change deniers would throw in the towel," added Peter Hannam, Environment Editor of the Sydney Morning Herald. Dr. Christy agrees with his colleagues that the climate is always changing, but believes their alarmist rhetoric — and even some of their research — is misguided at best, and perhaps even deliberately misleading. The temperature data cited by most global warming alarmists comes from surface-level measurements, which are notoriously inaccurate. A 2009 study of the surface-level reading stations found many of them "located next to the exhaust fans of air conditioning units, surrounded by asphalt parking lots and roads, on blistering-hot rooftops, and near sidewalks and buildings that absorb and radiate heat." Sixty-eight stations were found to be "located at wastewater treatment plants, where the process of waste digestion causes temperatures to be higher than in surrounding areas." Dr. Christy notes that there are more accurate ways to measure temperature data, but they are often ignored by climate scientists because they do not affirm their predetermined outcomes. "The deep atmospheric temperature – a much better metric for monitoring climate – as measured by satellite sensors was the 3rd warmest year since 1979," he said of 2015. "If no mention is made of what the bulk of the atmosphere is doing, then these folks are withholding important information." Dr. Christy laid out his approach to climate science during testimony before the U.S. Senate last year. "I build data sets from scratch to answer questions about climate variability and to test assertions people make about climate change," he said. "That’s really what the scientific method is all about." It is that commitment to starting "from scratch" that has made him a particularly bothersome thorn in the Environmental Protection Agency’s (EPA) side in recent years. While Christy does not deny the Earth’s climate is changing, he vehemently rejects the assumptions at the core of the EPA’s growing list of environmental regulations. In its Clean Power Plan, the EPA is pushing for a 750 million metric ton reduction in CO2 emissions, which it seeks to achieve in large part through regulations on existing power plants, especially coal-fired plants. A study released by the U.S. Chamber of Commerce last year predicts the environmental mandates in the plan will ultimately cost the United States more than 220,000 jobs. According to the study, the proposed regulations will have a disproportionate impact on southern states, where energy costs would jump by $6.6 billion per year over the next decade-and-a-half. The "East-South-Central" region of Mississippi, Alabama, Tennessee and Kentucky would see its GDP shrink by an estimated $2.2 billion and would lose 21,400 jobs as a result of the plan. Dr. Christy on Wednesday testified that such onerous regulations will do little to nothing to actually impact the climate. "If the United States had disappeared in 2015, no more people, no cars, no industry, the impact on the climate system would be a tiny few hundredths of a degree over 50 years – and that’s if you believe climate models," he concluded. SPOKANE — Theories about increasing global temperatures fail to take into account the impact of factors other than the amount of carbon dioxide in the atmosphere and the cyclic nature of climate, a well-known meteorologist told farmers on Feb. 2. Art Douglas, professor emeritus at Creighton University in Omaha, Neb., spoke about global warming during his presentation at the Spokane Ag Expo and Pacific Northwest Farm Forum. One problem he sees is relying on air temperature records. "I trust sea surface temperatures more than I do air temperature," Douglas said. "Air temperature is screwed up by cities. You have a whole mix of things that can screw up an air temperature record." Much has been said because the last two years were the warmest on record, with the globe warming by 0.7 degrees centigrade. However, Douglas said that carbon dioxide and global temperature patterns from the last 50 years seem to match cyclical patterns going back 400,000 years. He showed two charts — one of the carbon dioxide content of the atmosphere and one of the air temperatures — that were produced using Antarctic ice core samples and go back 400,000 years. In those cycles, global temperatures increase as the amount of carbon dioxide increases — and both cycle lower after reaching a peak before building back up. Douglas said the recent warming trend can be attributed 50-50 to human activity and natural climate variability. Assigning contributions to global warming solely by each carbon dioxide emissions ignores the impacts of other climate cycles and sun spots, Douglas said. "Historically speaking, we’re in a very cold period and a low CO2 period in terms of the planet," Douglas said. The wakes of large ships could be used to curb global warming, scientists argue. The shipping industry gets blamed for its share of environmental ills, from air and water pollution to collisions that kill whales and other marine animals. But in a new paper published last week in the Journal of Geophysical Research: Atmospheres, scientists argue that the wakes of big ocean-going vessels might actually be used to curb global warming. The scientists say that dramatically extending the lifetimes of the foamy wakes (and making them a bit brighter) would boost the Earth's surface reflectivity (what scientists call albedo) and reduce the extent to which sunlight warms our planet. Wake bubbles typically pop within a matter of minutes. But "if we could make the bubbles in the wake last for 10 days, then I believe this scheme could potentially reduce global warming to some extent," Dr. Julia A. Crook, a research fellow in the Institute for Climate & Atmospheric Science at the University of Leeds in England, told The Huffington Post in an email. Crook and her co-authors maintain that their climate model shows the scheme could bring a 0.5-degree Celsius reduction in the Earth's average surface temperature by 2069, helping to offset the 2-degree warming expected by then. According to Crook, the effect is comparable to those achieved by other so-called geoengineering schemes that have been proposed in recent years. Of course, those bubbles won't resist popping just because we want them to. The scheme calls for the ocean-going ships to pump out a stream of chemicals known as surfactants as they move along. Surfactants help prevent popping by affecting the surface tension of water -- at the same time making the wakes a bit whiter than they would be ordinarily. But it's not clear whether the scheme would be safe for marine life. And then there's the matter of its effect on air quality. "Previous research suggests surfactants reduce the amount of CO2 uptake by the ocean, which would mean by adding surfactant we might cause atmospheric CO2 to go up," Crook said. "But by how much and whether the resulting warming from the extra CO2 would outweigh the increased albedo is unknown. This could be a show-stopper." Dr. David Keith, a professor of applied physics and public policy at Harvard and a noted expert on geoengineering, said real-world feasibility and cost are other key issues. "Nobody doubts that if you can make the bubbles last it makes the sea whiter," Keith said. "That’s easy. The hard part is whether you can make the bubbles persist and do it in sea water." To fully assess the scheme's cost, safety and feasibility, he said, it will take more than a climate model. It will take real-world experiments. Much like many campaigns out there, the Renewable Fuel Standard that mandates the use of biofuels in our gasoline has been full of empty promises. When Congress passed the Renewable Fuel Standard in 2005 and expanded the mandate in 2007, policymakers promised reduced dependence on foreign oil, a new source of cleaner energy to lower gas prices, a stronger economy, and an improved environment. This was certainly wishful thinking, as none of it has come true. Instead, the policy has resulted in adverse effects to the economy and the environment and demonstrated the folly of the government attempting to centrally plan America’s energy future. The Energy Policy Act of 2005 first mandated that renewable fuels be mixed into America’s gasoline supply, primarily using corn-based ethanol. The 2007 Energy Independence and Security Act increased the quotas significantly. By 2022, there must be 15 billion gallons of corn-based ethanol and a total of 36 billion gallons of biofuels blended into the nation’s fuel supply, including soybean-based biodiesel. The program does not end in 2022, however, but grants the Environmental Protection Agency authority to set yearly targets. The mandate has harmed Americans in a number of ways. Ethanol has only two-thirds the energy content of petroleum-based gasoline, so drivers pay more. In addition, the Renewable Fuel Standard has not delivered on the promise of reducing dependence on oil and protection from high prices. Because ethanol contributes such a small percentage of the overall transportation fuel market (a mere 5 percent in 2014), it has failed to tamp down prices, which mostly continued to climb from 2002 to 2012 despite increased mandated ethanol use and high oil prices allegedly making ethanol more competitive. Supply and demand (largely of crude oil) will determine the price at the pump, and the contribution of the Renewable Fuel Standard as a transportation fuel is a mere drop in the bucket against the nation’s entire fuel use. The Renewable Fuel Standard also artificially diverts food to fuel, driving up prices at the grocery store. A few years ago, 40 percent of America’s corn crop went to ethanol production. In 2012, the amount of corn used to produce ethanol in the U.S. exceeded the entire corn consumption of the continent of Africa and in any single country with the exception of China. Now, if market forces drove corn production away from food use and toward transportation fuel because it were more profitable, there would be no problem. But that’s not what is occurring here. Producers are diverting food to fuel because of the government-imposed mandate, and since corn is a staple ingredient for many foods and an important feedstock for animals, families are hit with higher prices from a wide range of food products. Policymakers hailed biofuels as the green solution to dirty oil. But, in its first of three reports to Congress, the Environmental Protection Agency projected that nitrous oxides, hydrocarbons, sulfur dioxide, particulate matter, ground-level ozone, and ethanol vapor emissions, among other air pollutants, increase at different points in the production and use of ethanol. A study by Iowa State University researchers concluded that incentivizing more biofuel production with government policies leads to more adverse environmental consequences caused by farming, the use of fertilizers, and land-use conversion for agricultural production, resulting in increased soil erosion, sedimentation, and nitrogen and phosphorus runoff into lakes and streams. Though the mandate benefits a select few in the Midwest, the Renewable Fuel Standard spreads the cost to the rest of Americans, including many in the agricultural community. The biofuels mandate gives preferential treatment to the production of corn and soybeans at the expense of other agricultural products and artificially eliminates the risk and competition necessary to drive innovation and economic growth. The problem with the Renewable Fuel Standard is not the use of biofuels themselves, but rather that it is a policy that mandates the production and consumption of the fuel. Having politicians centrally plan energy decisions best left for the private sector distorts markets and demonstrates the high costs and unintended consequences of government control. Congress should admit that the Renewable Fuel Standard is costly to the economy and the environment, benefiting a select group of special interests. Importantly, Congress should recognize that the federal government has no business determining what type of fuel we should use and how much of it we should consume each year. The only viable solution to this broken policy is to repeal the biofuels mandate altogether. The CSIRO's climate science divisions are expected to be pared back as part of a massive shake-up of the organisation. The ABC understands cuts are expected to be made within the Oceans and Atmosphere and Land and Water divisions and up to 350 positions in the organisation will change. The organisation will attempt to redeploy as many staff as possible into emerging areas such as data science, but there are likely to be redundancies in the process. "It's inevitable that people who are gifted at measuring and modelling climate may not be the same people who are gifted at figuring out what to do about it how to mitigate it," he said. "Some of the climate scientists will be able to make that transition and some won't." Dr Marshall said the shake-up was about renewal for the organisation and addressing the low turnover rates of staff. "On the good side that means people love working for CSIRO but on the bad side most companies have much higher turnover than we do," he said. The good thing about turnover is it creates a career path for junior scientists to aspire to. In a statement, a spokesman for Science Minister Christopher Pyne said: "This is an operational decision of the CSIRO. After an extensive review, the management of the CSIRO have stated the need to re-organise the organisation to better fulfil its mission as outlined in its strategic plan"
In 2014, the Federal Government slashed more than $110 million from the organisation's budget, prompting national protests. But scientists became far more optimistic when the Prime Minister launched the National Innovation and Science Agenda in December last year. Malcolm Turnbull committed $90 million to the CSIRO to support increased commercialisation of research. He also announced $75 million of funding to a CSIRO business unit known as Data61, which will focus research on areas such as cybersecurity and robotics. At the time, Science Minister Christopher Pyne said organisations like the CSIRO were "among the best in the world".